pseudobunny & co.: Where have I been? Well..It has been a busy few weeks and my brain is still not settled at all. Great visit from my mom, her mom, and the aunties! 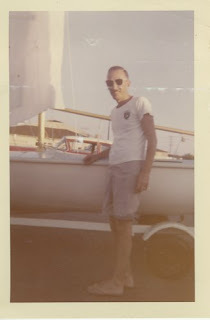 I finally uploaded some scanned photos from my dads massive collection and am working on that project this summer. Going to try and build a playhouse thing for Osky in the backyard. Lots to do this summer. I will make a list soon and post it here to see if I can finish all the goals I have set for myself. More later when I am really decompressed. That is a photo of my dad from 1960. Looking good dad. Looking good.